After many recommendations from friends, I finally got to see the movie Ed Wood last night. It was fantastic! I don’t think I’ve ever been so attached to cinematic characters in quite a long while. Martin Landau’s and Johnny Depp’s performances were heart-wrenching. I know, love, and work with people like them; people who have such a heart and passion for storytelling, such a clarity of vision and sense of purpose: and no money or help to make it happen. I would argue that most artists have a sense of the sensation of their own lives. In a hyper-reactive way, they can commune with the drama of their Selves, and, in the act of doing so, they pull out the drama in each Other. My own heart comes alive in new ways when I read a story or view a film that touches a chord in my soul that’s hidden away from the glaring light of the working day. Creatives like Ed Wood are the unfortunate canary in the cage—their own demise is a signal of the loss of breathing room in our culture’s search for riches. No, of course Ed Wood’s films aren’t a gold mine. And they should probably never be remade—-not because they are the worst films of all time, but because they are valuable exactly as they are. Tim Burton’s rendition of his life puts it right up in your face: every person’s voice and story is important, simply because it exists. Not because you can make money off of it. How do you cut yourself free of the Puppetmaster Dollar? But, in the same moment, making money is absolutely vital. And the film shows with unflinching sorrow the merciless Puppetmaster Dollar, pulling the strings of Ed, Delores, Vampira, and—most agonizingly—Bela. And the show goes on. Not the shows that we want to make, but the show of our lives. As the title of my blog indicates, this life is not a dress rehearsal. It is the big performance. There is no going back. You are on stage and the cameras are rolling, and it doesn’t matter if you’ve never done improv before, everybody is already watching you. Tim Burton maintains an excellent conceit to help us understand this concept in the film: everything about the movies that Ed makes (or anyone else for that matter—Vampira, Criswell, etc.) is devastatingly realistic. And everything about their real lives (the morphine, the cross-dressing, the self-promotion, the Brown Derby fundraisers, the premiers, etc.) is over-the-top dramatic in the delicious generic vein that Ed Wood tries so hard to create in his pictures. The intense pock-mark lighting, the extreme camera angles, the alienating long shots, the high contrast black-and-white, the outrageous props hanging on the fringes of the frames—-all these glorious tricks of the trade make you stare in awe at the drama of the mundane. The ultimate crushing irony of Ed Wood is that his life itself was the best picture he ever made. 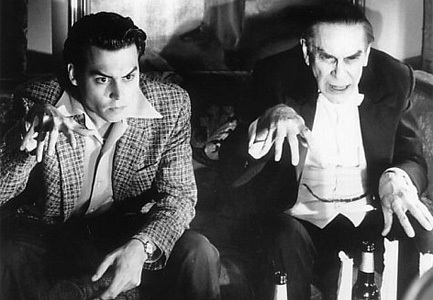 Ed Wood's glory and failure: he couldn't see himself for what he was.